Relics of the lunar calendar are quite abundant in the Lithuanian and Latvian etnography. A custom remains to our day: upon seeing the new crescent Moon, one addresses it as kunigaikštis (a duke) or dievaitis (a young god) and begs for good health . The four phases of the Moon are considered important for beginning of most farm work, especially, sowing and planting . The magic numerals 3, 7, 9, 18 and 27, so frequent in the Lithuanian folklore, may be related to the archaic lunar calendar. 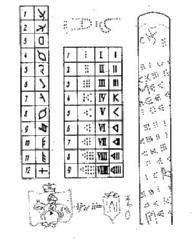 It is quite probable that the oldest numeration in the history of mankind was trecimal. Strokes or dots which make the ornaments of the Neolithic ceramic artifacts are often grouped in triades. Number three and its multiples are found in many Lithuanian folk songs and legends. And even ritual formulas acquire their magic power only when repeated thrice. A drink boiled from a mixture of herbs gathered on an early morning of the Midsummer Day (summer solstice) from 3 fields in bunches of 9 different herbs, has particular magic properties. Historical records give evidence that the week of ancient Balts was 9 days long. Thus, the siderical month must have been divided into three parts. It is quite probable that a similar week is represented by a deer with nine horns, a popular character of the Lithuanian Advent songs. Trecimal numbers and crescent-shaped pendants have been found on a bronze necklace excavated in a 2000 years-old Baltic grave . (Fig. 13). On each side of the artifact there are repeated groups of 3 and 9. Fig. 13. 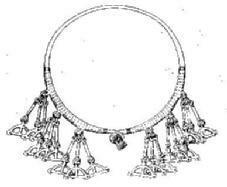 A bronze necklace used by a Baltic woman 2000 years ago. The solar calendar appeared on the Baltic territories with the introduction of an agricultural economy, i.e. in the third millennium B.C. Flat amber discs divided to quarters by sequences of pits, found in the Nida and other settlements, are considered to be the first amulets of the solar magic, the rudiments of the annual solar calendar (division of a year into the seasonal quarters) , . The texts of Lithuanian folk songs suggest a possible existence of a ten-month (300 days) calendar which might have embraced only the warm period of the year when all farm work was in progress. With the evolution of calendar, the lunar cycle was included into the solar year, which resulted in calendars of the solar-lunar type. The oldest Baltic cosmological schemes, calendars, found on the burial urns dated 600-200 B.C., are in custody of the Gdansk archaeological museum in Poland . The splendid 12-month calendars engraved on pottery have been found near the borders of the Baltic area, in the present territory of the Ukraine which date back to the beginning A.D. . In the 14th century the Grand Duchy of Lithuania used a solar-lunar calendar. The structure of this calendar was understood with the help of the so-called Gediminas Sceptre discovered in 1680 . (Fig. 14). The sceptre indicates that the year started in April and normally had 12 months varying from 29 to 31 days. Every month started with the new moon. The months have unique Lithuanian names, expressed in symbols, which reflect natural phenomena and agricultural activities. Fig. 14. The so-called duke Gediminas Sceptre calendar used in Lithuania in the 14th century. From right to left: general view of the sceptre, designations of 9 days in a week, designations of the 12 months. The Balts were familiar with the moments of equinox and solstice and marked them with festivals . Summer solstice was celebrated as Rasos or Dew (Midsummer Day), which later on, with the introduction of Christianity, turned into St. John's day. Winter solstice almost coincides with Christmas. Spring equinox festival Gavėnia, under the Christian influence, turned into Užgavėnės (Shrove-tide), farewell ceremonies for the long winter. The autumn equinox festival Ilgės, marking the end of harvest, merged later on with the Christian All Saints' Day and became Vėlinės (The Day of Souls). Three hundred years ago Praetorius  recorded the Lithuanian names for the parts of day and night which can be considered a type of folk clock. Day and night were divided into 16 parts, starting with the early morning and ending late in the night. Later on, Daukantas  listed the names of 24 parts of day and night. Most of these names are still in use, although their practical significance is long lost. In Lithuanian there also exist separate terms to denote day (diena), night (naktis) and day & night (para). In the Grand Duchy of Lithuania pantheistic religion was preserved till the end of the 14th century which means that Lithuanians were the last pagans in Europe. Due to this fact, many Baltic gods are described in folklore, chronicles and books which allows us to reconstruct details of the religion of ancient Balts. The mythology of the ancient Balts and the pantheon of their gods are important coomparative sources for better understanding other pantheistic Indo-European religions (, vol. 1, p. 153 and 527 and ). Historical records and folklore survivals have preserved the names and functions of about 120 Baltic gods and goddesses , part of them related to heavenly bodies and phenomena. The highest Lithuanian god, the creator of the world, was called Praamžius, Satvaras or Prakurimas, and sometimes simply Dievas (the God). The word Dievas has Indo-European connections since similar words can be found in other Indo-European languages: Dyaus in Indo-Aryan, Zeus in Greek, Deus in Latin, etc. The highest god of Old Prussians was Okopirmas. Probably, as early as in the Neolithic, the personified heavenly bodies appear: Saulė (the Sun) and Mėnulis (the Moon) as well as the planets, the Sun's daughters: Aušrinė (the morning Venus), Vakarinė (the evening Venus), Indraja (Jupiter), Selija (Saturn), Ziezdrė (Mars) and Vaivora (Mercury). Interpretation of names of the last four planets has been done by Slavėnas  on the basis of mythological materials. Moreover, several folk-tales and songs say that Žemė (the Earth) is the Sun's eldest daughter. It should be noted that, in contrast to many nations, the Lithuanians had mythical imagery of the Sun as a goddess and the Moon as a male god. The same applies to gender usage in modern Lithuanian: the Sun is feminine and the Moon masculine. For all the planets are given feminine names. In some folk-tales, Venus is called Marių Žvaigždė (the Sea Star) and Mercury is Aušrinės Tarnas (Morning Star's Servant). In Latvia, the morning Venus is called Auseklis and the evening Venus is Rieteklis. Saulė (the Sun) was imagined as a beautiful goddess of the sky who lived in a palace somewhere far east. Every morning she drives into the sky in a brilliant chariot of gold, copper or fire pulled by two white horses. In the evening the chariot goes down into the Baltic sea and Saulė changes the chariot into a golden boat which takes her across the sea. The boat is steered by the goddess Perkūnėlė who bathes the tired and dusty Saulė and sees her off, the next morning, refreshed and shining for a new journey through the sky. Mėnulis (the Moon) was a young god, dressed in silver attire, Saulė's husband. He had fecund, vitality-giving functions and was the guardian of night and time. Rich mythological imagery was connected with the four phases of the Moon, being considered of vital importance to animals, plants and the weather. One interesting tale tries to explain the solar eclipses: the Sun and the Moon are kissing each other; they cover themselves with a wrap, trying not to be seen by their daughter, the Earth. Myths speak of Vakarinė (the Evening star) who made the bed for Saulė, and about Aušrinė (the Morning star) who burnt the fire for Saulė and made her ready for another day's journey. Aušrinė was a maiden of remarkable beauty with golden hair and an image of the Sun on her crown. She wore a starry mantle with a moon-shaped brooch on her shoulder and was often considered to be even more beautiful than the Sun herself. Fig. 15. The flag of Old Prussians with three main gods: Perkūnas, the god of thunder, in the center, Patrimpas, the god of spring and fertility, at the right, and Pykuolis, the god of the dead and underground, at the left. The script is in the Old Prussian (from S. Grunau, Preussische Chronik, Hrg. von W. Perlbach, vol. 1-3, 1876-1895). One of the most important sky gods was the god of thunder and all storms Perkūnas (the Thunder), fecundator and cleaner of the earth from the power of evil (Fig.15). He was imagined as a stern, bearded and powerfully-built man who traversed the sky in a fiery chariot, drawn by swift horses or as riding a fiery horse. His head was surrounded by a wreath of flames. In one hand he held lightning bolts and, in another, a heavy stone axe. Nine festivals devoted to Perkūnas were celebrated throughout the year starting in the early spring. Figurines of Perkūnas have been found in the Kernavė settlement, in the so-called Perkūnas house in Kaunas, etc. An interesting folk-song involves the Sun, the Moon, their daughter Aušrinė (the Morning Star) and the god Perkūnas. We present it as written by Balys . Today the Sun and the Moon, the heavenly couple, are divorced and they never rise and set together. The cause of their enmity is explained in the following myth. The Moon married the Sun in the primeval spring. Because the Sun rose early, the Moon separated and walked alone. He met the Morning Star and fell in love with her. Then Thundergod Perkūnas became angry and punished the Moon by striking him with his sword. The Moon's face, therefore, often appears as cut in two pieces. The Perkūnas's word probably is a comet. Among the most important Prussian gods is Swayxtix or in Lithuanian Zvaigždikas, the god of light. In Lithuanian mythology, he is imagined as a horseman with a sword. Other deities related to celestial phenomena were the sunrise goddess Aušra (sometimes Auska or Brėkšta) and the evening dusk goddess Žėja. Atmospheric phenomena were portrayed as a family of wind gods: Vejopatis, Audrupatis, Bangpūtys, Gardaitis and Divytis. They lived in a cave on the bottom of the sea. Other high Baltic gods should be mentioned: the great mother Žemyna (or in Latvian Zemes Mate), the goddess of the earth and fertility; Patrimpas, the god of spring and fertility, the guardian of rivers and springs; Autrimpas and Andojas, the sea gods; and Pykuolis and Velinas, the underground gods. In Latvia, other gods, related with the sky objects, are known: the highest god Dievu Dievs or Vecais Tevs, the god of the Sun and the morning light Usinš, Dieva Deli (God's Sons) and Saules Meitas (Sun's Daughters). For worship of gods and goddesses, the Balts erected temples or sanctuaries the remains of which were excavated in the mounds of Tushemlia and Gorodok on the Sozh River, now in Russia (3rd - 4th centuries) , on the Blagoveshchensk hill on the Desna River near Briansk, now in Russia (5th - 6th centuries) , on the Bačkininkėliai mound near Prienai, Lithuania (1st - 5th centuries) , etc. Of later times, well-known are the Romovė temple in Prussia, the Perkūnas temple in Vilnius, the supposed goddess of love Milda temple near Kaunas, etc. An analogy is easily drawn between the Baltic mythology and the mythology of Indo-Aryans, Greeks, Romans and other ancient peoples. Even the names of certain gods are similar. No doubt, the northern and southern nations communicated as early as 2000 B.C., as evidenced by finds of Baltic amber in Crete, Troy, Egypt and other countries of the Mediterranian. Evidence of a direct contact has been fixed by Hecataeus of Miletus and Pindar (5th century B.C.) and Herodotus (4th century B.C.) who mention the Hyperboreans who lived north of the Scithian tribes. The Hyperboreans were said to have the same religion as the Greeks. Their land was considered the birth-place of titaness Letona (Leto), mother of the twin-gods Artemis and Apollo. Apollo visited his motherland every year and spent the winter months there. Rybakov  after analyzing existing historical sources, concludes that the Hyperboreans of the 6th - 5th centuries B.C. were Baltic tribes. Since the Zodiac is now viewed as the product of the Indo-European culture , it is quite probable that the Balts were familiar with it from a very early date. Lithuanians were well acquainted with the 12 Zodiacal constellations throughout which the Sun makes its annual journey. The Rivius chronicle  says that in the 13th century in the Šventaragis valley, at the confluence of the Neris and Vilnia rivers, there stood a Perkūnas temple which had 12 steps, each with an altar. Every month in succsession, holly fire was burnt on one of the 12 altars. The latest archaeological excavations in the basements of the Vilnius Cathedral completely confirm this information . However, the ancient Lithuanian names of the Zodiacal constellations probably did not survive to our days. Their names, recorded in the 17th century by M. Sarbiewski , resemble translation from Latin. It is interesting to note that in Lithuanian the planets are called žvėrynės (from žvėris, the beast). This probably means that planets always move along the Zodiac, the beast circle . Kūlėjai ir Spragilas (Threshers and Flail) Perseus? Grėbėjos (Rakers) Taurus and Auriga? Artojas (Ploughman) ir Jaučiai (Oxen) Leo and Gemini? Sėjikas (Sower) Bootes and Coma Berenices? The surviving names of the brightest stars are not so numerous: Šiaurinė (the Northern star), Polaris; Perkūno Ožka (Thunder's Goat), Capella; Tikutis (no translation), also Capella; Mergelė (the Maiden), Spica and Skalikas (Hound), Sirius. There are some unidentified star names. Similar or the same names of some constellations are still being used by Latvians . The great number and originality of names of constellations, stars and planets demonstrate that the ancestors of the Baltic nations were well acquainted with the starry sky. Other celestial objects and phenomena have specific Lithuanian names. Comets are called dangaus rykštės (the sky rods), Aurora Borealis are gaisai or pamėnai (the glow), circles around the Moon are drignės, meteors are krintančios žvaigždės (the falling stars). Every man was believed to have his own star in the sky. When the man dies, his star falls down. According to another version, a meteor is a mythological creature aitvaras that flies in the air bringing wealth to his owner. The rainbow (vaivorykštė or Vaivos juosta, drignis) is a frequent personage of mythological tales. The sky in Lithuanian is "dangus": this word originates from the verb "dengti" (to cover). It is quite possible that more unique Lithuanian constellation names survived to our day, since some constellations could have the same names as in Latin or Greek, i.e. pre-historic Indo-European names. These names could have been brought to the Baltics from Asia Minor or northern Mesopotamia 2500 B.C. by the people of the Corded Ware culture which would explain the appearance in the Lithuanian sky of Lion, Dolphin, Scorpio and other southern creatures. The strange frequency of lion (liūtas, levas) in the Lithuanian folk-tales, noted by Basanavičius , could be explained in a similar way. In adjusting the solar and lunar calendar cycles, accurate measurements in the sky and the use of special equipment were required. Properly educated people were also needed for the task. Historians such as M. Praetorius, A. Rotund, M. Stryjkowski and T. Narbutt present evidence that the motions of heavenly bodies were being observed by special prophets (men and women) called žvaigždininkas (a star man) or krivis (a priest). The observations were needed to construct the calendar, to foresee important astronomical events, and to appoint the time for sacrificial rites. Crusader chronicles mention the Prussian prophets called tullissones and ligaschones . The prophets used to take part in burial ceremonies, they observed the riding of souls on horseback across "the middle of the sky". Cardinal Peter d'Ailli, who visited Lithuania in 1418, mentions that he saw there skillful astronomers who were managing the calendar . Rudimentary observatories were erected in certain places. For instance, the Rivius chronicle  mentions a round tower for observation of stars and the Sun, built in 1263 by duke Gerimantas in the Šventaragis valley in Vilnius, near the Perkūnas temple. 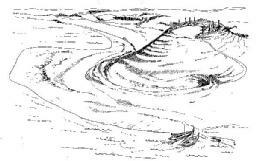 A pole observatory once existed on the Birutė hill in Palanga, near the Baltic sea  consisting of a horseshoe-shaped sand embankment with eleven dug-in posts. Each pair of posts marked some important azimuths of the Sun and the Moon at the moment of setting to the sea (Fig. 16). Solar azimuths at the days of solstice and the Moon extreme azimuths in the Meton cycle are fixed. Fig. 16. A pole observatory on the Birutė hill in Palanga, near the Baltic sea (reconstruction). Sometimes stones were used to mark the positions of heavenly bodies on the horizon. For instance, at the site next to the Purmaliai mound near Klaipėda, seven huge boulders, arranged to mark astronomical directions, have been found . On the day of summer solstice, the Sun rose like a "golden crown" (quoted from a folk song) over the biggest boulder. Over other boulders it rose on the mornings of the equinoxes. Circles of stones and other regular stone configurations were common in the Baltics . However, only their scarce remains are found. Most observatories must have been wooden and, naturally, did not survive. Some boulders with astronomical symbols are still present in territories of the ancient Balts (Fig. 17). Fig. 17. 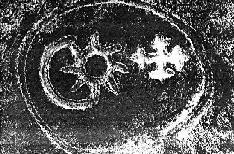 The signs of the Sun, the Moon and a star on the Valiulis boulder of three meters diameter in the Molėtai district, Lithuania. In addition to having calendric significance, stone circles might have served also as instruments to determine the azimuth while burying the dead . It is known that in the 1st - 4th centuries in central Lithuania the dead were buried facing directly towards sunrise (men) or sunset (women). Also, many mythological stones in Lithuania are called Mokas (from the word mokyti, to teach), as if in such places young people were trained to make astronomical observations. The described archaeological finds, folklore, mythology and linguistic data and ancient written sources allow us to conclude that already 4-5 millennia ago the people of Old Europe who were living to the East and South of the Baltic sea, the ancestors of the modern Baltic nations, did not differ much in their mythological views on the world structure from their contemporaries in southern Europe, Asia Minor, Mesopotamia and northern Africa. The calendar needs and religious rites forced the most educated people to observe the sky, to follow its periodical changes and, thus, to predict important astronomical events: the phases of the Moon, the moments of sunrise, culmination and sunset at different times of the year, the solstice and equinox moments, to appoint the beginning of farm work and festivals. Since people did not know the true cause of the natural phenomena, the gods and fate were made responsible for everything. Living in harmony with the surrounding world, they accomodated to sometimes severe conditions of life and transferred their knowledge and experience through millennia, from generation to generation. Acknowledgment. The authors are grateful to G. Kurilienė for her help in preparing this paper for publication.